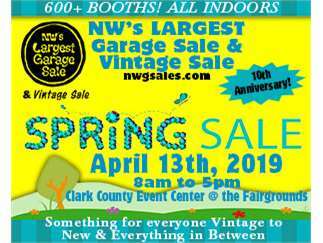 (Vancouver WA, – April 13th, 2019) On Saturday April 13th, “NW’S LARGEST Garage Sale & Vintage Sale” will host their Annual Spring Sale at the Clark County Event Center. April 13th is the 10th Anniversary of the sale. We will be doing raffles all day with over $3,000.00 in cash and prizes. NW’S LARGEST Garage Sale and Vintage Sale brings together hundreds of individual garage sales in one location, as well as thousands of shoppers. Our April sale fills three buildings at the Clark County Event Center. With over 700 booths, there is something for everyone at affordable garage sale prices in one location, all indoors. Each vendor sells their own items & keeps 100% of their own sales. This one-day event runs from 8am to 5pm at the Clark County Event Center, 17402 NE Delfel Rd. Ridgefield, WA 98642, just 15 Minutes north of Portland.